The original post was about the weakness of all demarcation criteria for what “science” is, or should be, and about the consequent legitimacy, in principle, of natural theology. As Steven Meyer has pointed out (based on pretty standard philosophy of science, his original field) pretty well any criterion of “science v non-science” breaks down at some point. Usually that happens when you stop comparing theoretical physics with fairies and enquire about psychology (the example I used with GD), archaeology or political science. Or as GD pointed out, even about less some substantiated aspects of biology. But in this post I want to explore not blurred boundaries, but the leakage that occurs, inevitably and probably in the final analysis beneficially, between epistemological categories that nobody disputes to be distinct. In looking for examples, I wanted to include the less “settled” (or more “speculative”) aspects of science to which GD drew attention. But I wanted to avoid the historical sciences like palaeobiology in which the disputes tend to be between philosophical or religious attitudes to a hidden past. I’ll come to them later. I should point out in passing that even GD’s “settled science” is settled only to the extent that it encompasses the most deeply-seated worldview commitments, and these can and have altered in the past, and might do so again. For example, the mathematical certainty of physics is only as secure as belief in the objective reality of mathematics, which as I’ve discussed in the past is open to dispute. Likewise modern science depends on a conviction that, suitably aided and controlled, our senses give us enough sense of reality for our theories to “save the appearances” lying atop the realities. Other philosophical foundations (eg the Vedantic maya) doubt this presumption. Nevertheless, here I’m considering only our own common worldview, and what ordinary western people regard as sources of knowledge. So as a hypothetical example, I’m using an idea based on the Iraq war, where total Iraqi casualties were disputed because different scientific models were giving very different estimates. The details don’t matter (and I’ve forgotten them anyway). But let’s postulate a more localised claim about an alleged, imaginary, atrocity somewhere in this troubled world. We’ll suppose there’s a repeated claim that a dictator or a terrorist army slaughtered an entire ethnic or religious community living within a certain city. Later on, the city was heavily fought over, many potential witnesses killed and the population scattered across the world. But the initial atrocity is the subject of a war-crimes trial, if it can be proven. But there are virtually no eye-witnesses, and in any case their reports tend to be predictably loaded by their ethnic and religious affiliations. Science must come to the rescue. OK, so one theory, based on the evidence of official death records and what graves have been found, suggests that if it occurred at all, there were only a moderate number of deaths, with no clear indication that a minority was targeted, and therefore no case to take before a war-trial. It has the advantage of using fairly hard evidence. The second theory is based on a computer model of the post-conflict deficit of population of the relevant minority, compared to the proportion in comparable cities in the country, using an estimate of the numbers in the city there before the war (for which, unfortunately, there are no accurate figures). This suggests an horrendous genocide – but is much “softer” and more model-based science. Let’s take for granted the obvious caveats from our everyday life and say that under ordinary circumstances you’d never have reason to doubt this guy’s accurate reportage or motivations. My question then is, would your belief in his personal testimony not incline you towards the theory that was more compatible with it, even though personal testimony is entirely extraneous to the science? I suggest that, whatever protestations might be made about leaving personal considerations behind at the lab door, your acceptance of your relative’s testimony would inevitably, and rightly, colour how you weighted the contradictory scientific evidence. If it wouldn’t, people would consider you an odd fish indeed. Remember here your relative is not making a claim against “settled science”, such as that he visited an island where time goes backwards. This is ordinary, not-entirely-settled science being influenced by knowledge sources outside science, such as personal testimony. Does such a mingling of epistemological sources happen? One would be a fool to think it doesn’t. Stephen Jay Gould’s Marxism is written all over his science, and what’s more, being a candid observer, he engaged in self-mockery about it. His 1972 punctuated equilibria theory of evolution, he said in an essay, perhaps appealed to him because unlike Darwin’s time, this was an age when revolution was in the air rather than uniformity. I suspect he would have said there was no coincidence in the fact that the universal rejection of Wegener’s 1912 theory of continental drift began to reverse after a paper published in the same year as the Paris student riots, 1968. In fact, mixed epistemology is vital for scientific progress. I’ve recorded before how Einstein “knew” relativity must be true as a teenager, long before there was any evidence available to him and before he discovered the maths to describe it. Michael Polanyi considered such insights the norm, rather than the exception, for new theories. Now, turning to religion, back in 2013 Mike Gene recycled a survey of élite non-religious academics. Very few, in fact, gave science-based reasons for their unbelief, the strongest being the rather circular and question-begging, “There is no scientific evidence for God.” More often they gave answers such as that they had never been religious and were uninterested (eg zoologist Gabriel Horn, physicist [of quantum robin fame] Jim al Khalili); lack of personal experience of God (geneticist Ken Edwards); aesthetic judgement that the universe is more wonderful without God (Craig Venter); loss of faith during a philosophy course (anthropologist Melvin Konner); family background (physicist Peter Higgs); put off by priests (anthropologist Jonathan Parry); the problem of evil (geriatrician Raymond Tallis). Now, some or all of these may be rational reasons for unbelief, but they are irrelevant to science (though often used by scientists arguing publicly against religion). Would one expect the resulting worldviews, though, to have no influence at all on their scientific lives? Most of the above are not militantly anti-religious, though Al Khalili is President of the British Humanist Association, whose website is perfectly happy to major on his scientific credentials (it’s hard to think why else he was elected President – few working physicists get to be Archbishop of Canterbury). Geneticist Steve Jones, whose own “testimony” is based on the old nineteenth century claim of incompatibility between science and faith is also on Mike Gene’s list, and his spokesmanship for atheism, using his status as a scientist in support, is well-known and can be seen at the website of the campaigning British Secular Society, of which he is an “honorary associate” together with other outspoken secularists like Peter Atkins, Richard Dawkins and Lawrence Krauss (and my old physiology lecturer Colin Blakemore). It is very clear from their associations and their writing that these guys do not leave their non-scientific beliefs at the lab door. And I’m very glad of it, because it confirms that scientific epistemology can never, in real life, be insulated from the other sources of knowledge and belief that make us human. There are no such neat firewalls around ideas. Science cannot be seen as a source of truth, but only as a more-or-less successful human search for truth of a particular, limited, kind. If that were not so, “leakage” from other epistemological sources would be unnecessary, and furthermore alternative scientific theories would not compete so violently as they do – reason would decide all peacefully. For scientists to have beliefs is a good thing, whether those are religious, anti-religious, political, philosophical or whatever. But it needs to be recognised that those beliefs will, inevitably, influence preferences for competing scientific theories. They form an irreducibly subjective aspect to science. Declare the interest and that’s not a problem. What’s more problematic is that such beliefs also affect what one regards as being science at all. That too is inevitable, since the boundaries of science cannot be determined by scientific methods, but by external considerations such as sociology, philosophy and metaphysics. But it’s less desirable because these areas are all matters of legitimate disagreement amongst interested parties. Many scientists are blissfully unaware that they have sociological, philosophical and metaphysical biases – a good many deny they are even valid categories. To have biases is the human condition, but to be oblivious to them is culpable. As I’ve written both here and elsewhere (see my BioLogos comment to Steven Meyer –near yours on the same post), I agree with you (and with Meyer) that there is no self-limitation in science about what may or may not be considered evidence, or about what kinds of explanations are acceptable. For example, like Meyer, I am quite sure that science does not presuppose methodological naturalism or prohibit teleology. Today’s attitudes towards those two things are empirical generalizations about what works and what doesn’t. If I were investigating this massacre, I’d take all evidence into consideration, especially the eyewitness account of an apparently neutral person (in spite of your insistence, there are indeed people who are close to neutral about any particular subject). Of course I’d also take into account the person’s background. If he regularly hallucinated dead bodies everywhere—or if he claimed that some of the dead bodies would never be found because they rose into the heavens until they were out of sight–I’d tend to discount his testimony. But this is all part of normal rational analysis. And in spite of your comments in the previous thread, this kind of analysis can be well-done or poorly-done, and it is often possible to pinpoint the flaws in the arguments used to reach the conclusion, or to be led by careful arguments to a conclusion that clashes with one’s worldview or one’s deeply held beliefs. We do not throw up our hands and say that it is all subjective so we can never decide, or we can never reach a reasoned consensus. Warning, this story will haunt you for a long time if you read it. And unfortunately, once you start, you will not be able to put it down. Good – we seem to agree that both truth and reason go beyond the boundaries of any one epistemology, which was the whole point of the post. As for the El Salvador story, it’s certainly the very kind of situation I sought to invent. So much that was needing to be said about such a small incident, which could be multiplied around the world and across the years… it was after all Holocaust Day yesterday. Discussing the issues fully as that essay does shows the simplistic nature of my example – in real life the UN might well have decided it was unwise to commission the scientific studies in the first place (or some big nation would have vetoed it). And my hypothetical reader, spirited into being an adviser, would suddenly realise he couldn’t take what the science said for granted, depending on who funded it, what pressures were brought to bear on the researchers, or what “higher purpose” they were serving. All of which, I feel, supports my point not that there is no such thing as rationality, but that it’s well-nigh impossible to find it… and in any case it will be coloured by personal and cultural understandings. One is always approaching some Platonic (or Divine) standard of reason, which doesn’t make it wrong to try, but should keep ones claims about achieving it very sober. The US Government in the El Salvador shambles, one supposes, were (at times, when not simply self interested or cowardly) working on some principle of greater good – better that a “few” innocent people die than that the whole world be destabilised. Certainly your writer attributes some comparable thing to the leaders on the ground – even if you kill your own supporters, they reasoned, it’ll scare the others into acting “sensibly”. That’s not at all unique – one of the things that Solzhenitsyn explores in Gulag Archipelago was Soviet “Revolutionary Justice” (note the co-option of the supremely rational concept of “justice”: the Bolsheviks saw it as the elevation of justice from its bourgeois Christian irrationality). This not only designated whole categories of people as “class enemies”, but had the success of the revolution justify, without shame, liquidating even loyal party members – the really loyal ones even accepted their sentence gladly as necdessary for the evolution of society.. That’s what makes sense of Stalin’s setting of local and regional quotas for denunciation: given the criteria of the revolution, it seemed perfectly rational so to do. In El Mozote, it seems to me that what would have saved the people, and what now judges their killers, local and distant, was not reasoning, tangled as it became with every other human failing, but a simple moral absolute: Thou shalt not kill the innocent. For some reason it all reminds me of an old Joe Jackson song. Jon, thanks for reading my link to EL Mozote. Yes, it does reveal how complex and difficult these things really are. All of which, I feel, supports my point not that there is no such thing as rationality, but that it’s well-nigh impossible to find it… and in any case it will be coloured by personal and cultural understandings. … the analysis of the evidence was there, laid out for the reader in clear, precise language, each successive sentence demolishing one or another of the myths put forward during the previous twelve years. essentially admitting that something big happened there. the Secretary of State’s Panel on El Salvador, created in the wake of the Truth Commission report, concluded that the Department’s handling of the massacre investigation “undermined the Department’s credibility with its critics — and probably with the Salvadorans — in a serious way that has not healed. The panel concluded its review by noting that “a massacre had indeed occurred and the U.S. statements on the case were wrong. On December 11, 1992, two Embassy officers went to El Mozote to attend a ceremony honoring those who had died in the massacre. Only the Wall Street Journal continued to dissimulate at the time. And today nearly everyone (especially Salvadoreans) accept the UN account. Consensus can be reached about rational arguments, even about such highly charged subjects as this breathtakingly brutal politcally motivated massacre, even without a completely unbiased observer. Lou, your discussion of the unravelling of the tissue of lies shows that it’s sometimes possible to arrive at factual historical truth by sifting testimonies and evidence. If that’s all you mean by “rationality” we’ve been at cross-purposes. I’m not sure I would call finding bodies, or having a nose for a true witness rather than a liar, come under anything but my most loose philosophical definition of “reason”. The harder job for reason would be to apportion the rights and wrongs of the issue (itself a moral rather than a logical matter). No doubt the Salvadorian amnesty was considered the most rational way to close the affair once it was blown.- No doubt anyone in the US government who had been in the know, and then expressed indignation against “them others” (or even attended the memorial ceremony) considered that such dissimulation was in the best interests of the good old US, regional stability, the war against communism and blah blah blah. I read that Machiavelli wrote The Prince to show the need for radical political action to defend the state against the vicissitudes of Fortuna, seen as chaotic forces antithetical to reason. Not being a politician I don’t see Machiavellian machinations as serving true reason – but the newspapers tell me every day that world leaders do. It depends on where you start your reasoning whether a course of action is rational. I never was talking about what course of action was reasonable. I was always talking about whether it was possible to rationally evaluate truth claims. It seemed like that was the point of your massacre example, and it was the p0int of my El Mozote example. In some cases there have been scientist (and people from many other professions) who have been shown to indulge in criminal activity, and have deliberately falsified data to obtain an advantage. It is dangerous to generalise when we argue for what human beings say is true or false. Because of this, civilised communities have endeavoured to set up methods and laws, and institutions, for the sole purpose of delineating on the matter of true and false, and dispensing justice. But even here we can see the problems we human beings have at arriving at a good judgement. For scientific work, scientists may disagree on matters they work on, and neither of these parties can be accused of falsifying data, or deliberately seeking to distort the truth. In such cases a great deal of insight and specialisation is required for anyone to come to a judgment regarding such matters. In cases such as evolution, origin of life, the nature of the Universe (just to name a few), and scientific outlooks that may encompass vast areas of our reality, the normal methods of assessing the reliability and deeper meaning of any scientific outlook may not apply, or may be inadequate. In such cases, each scientist’s personal outlook would be important – many (including myself) would be strident agnostics because we realise that our understanding and comprehension is insufficient to enable us to arrive at a scientifically valid outlook. Yet many scientific advancement must go through a period of speculation and debate – this would apply to any leading edge research in any field – be it “hard” or “soft” science. I regard this agnostic outlook on this type of scientific research as healthy – others may get excited and let their imaginations run amok, making outlandish claims. I oppose the latter only when they claim the authority of science, in a desperate attempt to appear legitimate. I do not see speculation as wrong but rather part of scientific research. Those who use speculation to appear authoritative and to convince non-scientist on some matter, I regard as ideologues, and not scientists. And yet, in spite of your hardheadedness and skepticism about things that we actually have good evidence for, you leave all this behind when it comes to your judgements about religion. Just as there is no wall between hard science and softer science, so too there is no wall between the processes involved in choosing between competing scientific theories and the processes involved in choosing between competing religions (or choosing no religion). I’ve never understood how people can apply such different evidential standards for these two questions. I don’t think it is justifiable. “Epistemology leakage” applies here too. You have a great difficulty and I cannot see how anything I say can help you deal with it. Faith, in the final analysis, is between God and the person – evangelicals usually say things like, “their calling”, or “personal experience of Christ” and other phrases, none of which appeal to an empirical investigation. There is then a great deal of detail and self-examination, all of which deals mainly with the person’s life, how she copes, and things like joy and hope; these are not separated for Christians, or religious people – everyone seeks fulfilment in their life. Those who do not believe inevitably seek similar things in their life, but they do so in other ways – however it always comes down to choosing between good and evil, and understanding what that means. If you put your faith is science and seek validation in that and materialism, you will (I suppose) still seek fulfilment and a sense of significance in your activities. I cannot fathom why you are obsessed with those who may have chosen a religious path for their life. I find even more puzzling, your insistence that empirical investigations are the be all and end all to coping with life. Science should (and often does) contribute to the communal wants and needs – it should serve the community. I find even more puzzling, your insistence that empirical investigations are the be all and end all to coping with life. My point is not that at all. 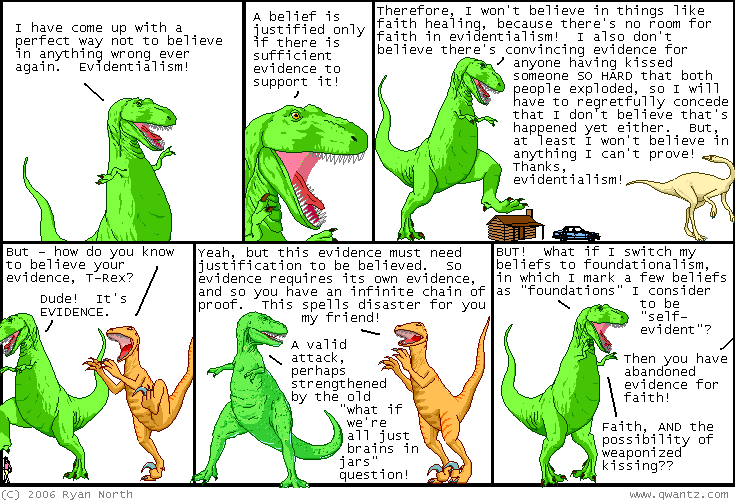 My point is that the truth of one’s beliefs really matters.